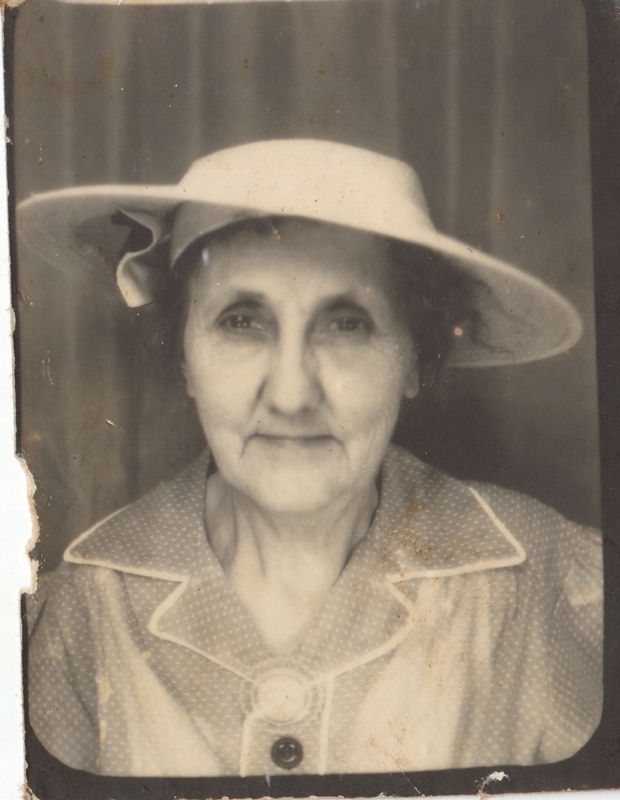 The family history of the Lucinda Harper (mother of Frank Privett) is highly uncertain. 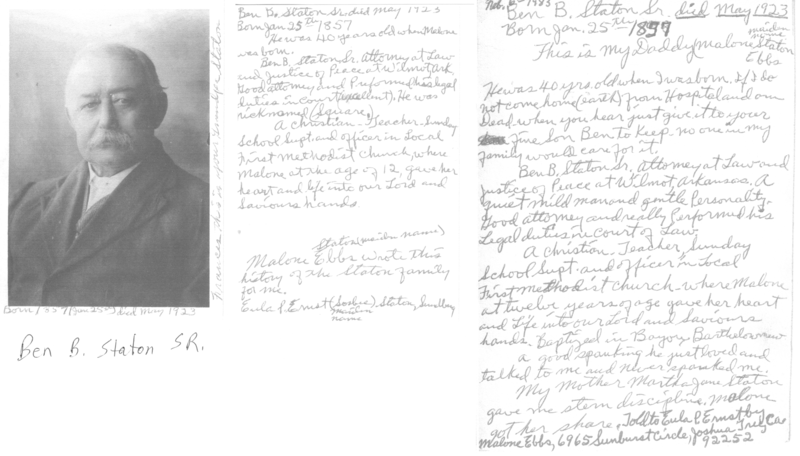 However, genealogist Frederic Saunders found the documents listed below. 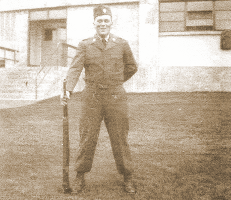 Details on his research can be found HERE. The story is obfuscated by numerous remarriages, inconsistent name reporting and unclear handwriting. 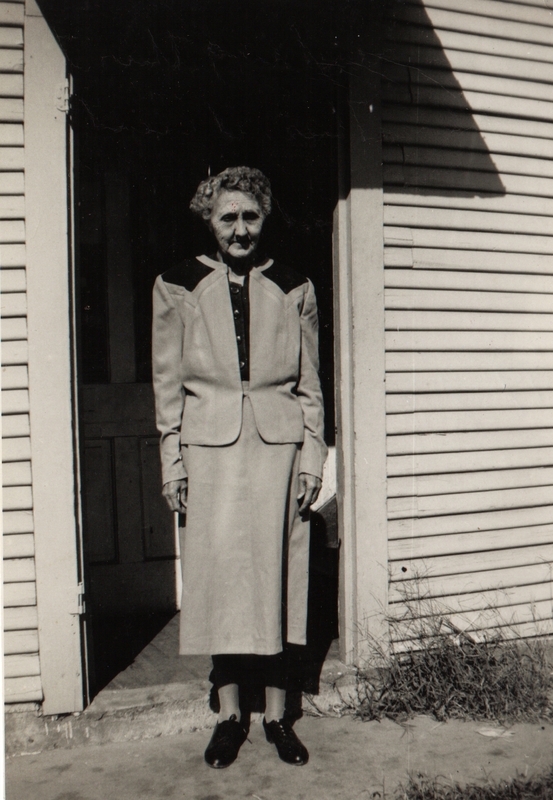 Lucinda Harper (mother of Frank Privett) was born on September 9, 1884 somewhere in Arkansas and had a twin brother Pleasant Harper. 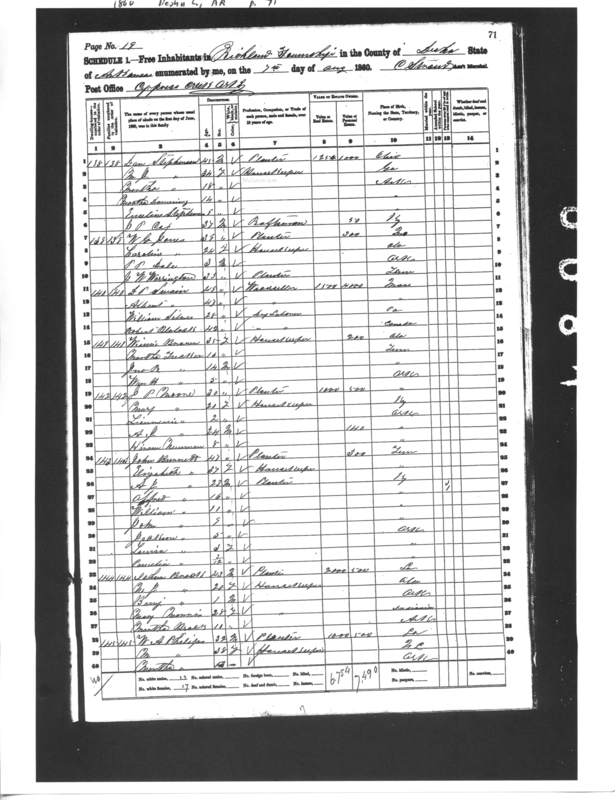 Lucinda is listed in the 1900 census as having a father from Tennessee and a mother from Arkansas and she allegedly claimed that her father was of native American ancestry. 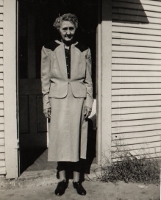 Lucinda was orphaned at an early age and was raised by her father's widowed sister, Eliza J. Varden (b. 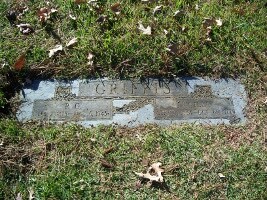 3/1884), in Kelso, Ark. 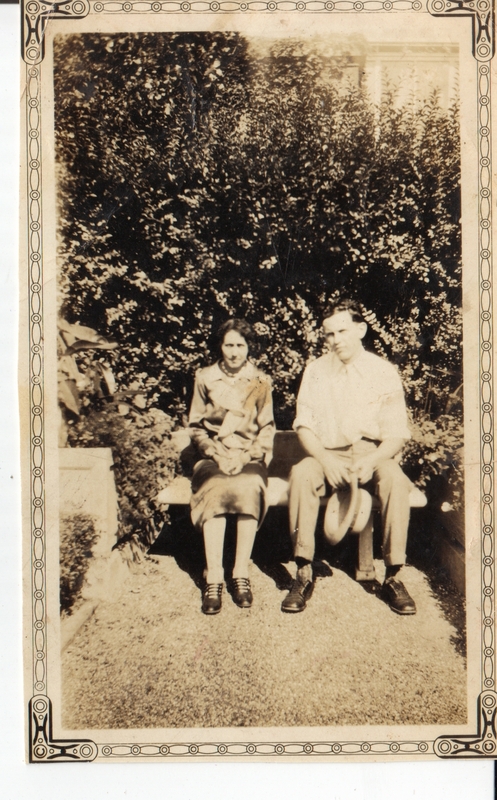 Privett Marriage: M.H. 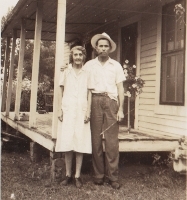 (Herman) Privett and Lucinda Harper were married in Desha County in 1903. 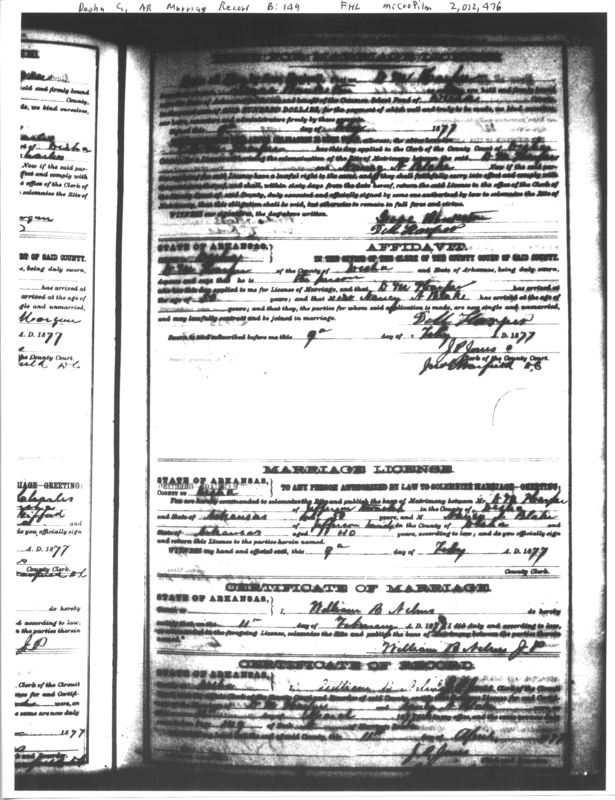 Oddly, their marriage license is dated February 14, 1903 but has no actual date of marriage. 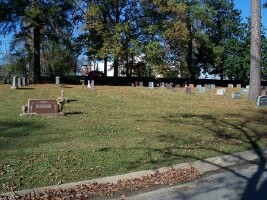 The Privetts had three children: William Frank Privett, Elizabeth Privett, and Jeff Davis Privett. 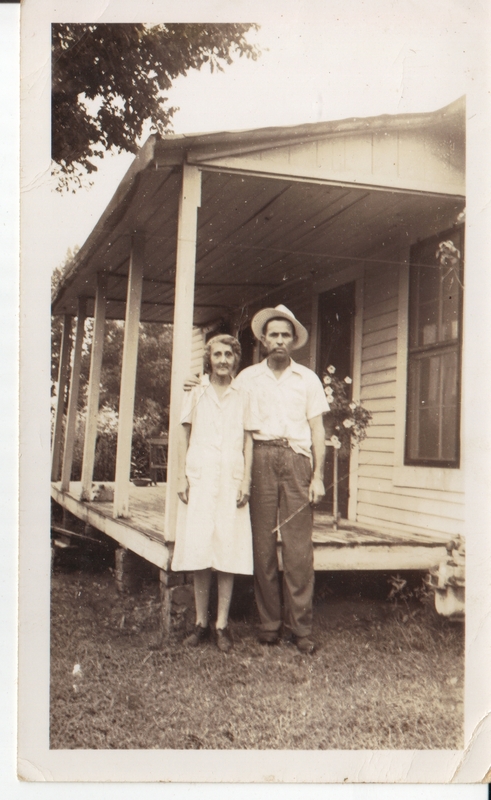 Herman Privett worked and lived in logging camp in Desha County, AR and supplemented his income by raising crops. 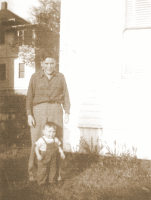 Herman Privett supposedly loved to hunt and passed that enthusiasm on to his son, Frank. 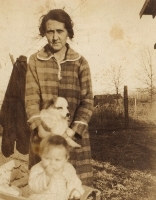 Privett Divorce: Lucinda and the children left Herman around 1911, reputedly because Herman was an alcoholic and/or would/could not provide adequately for his family. 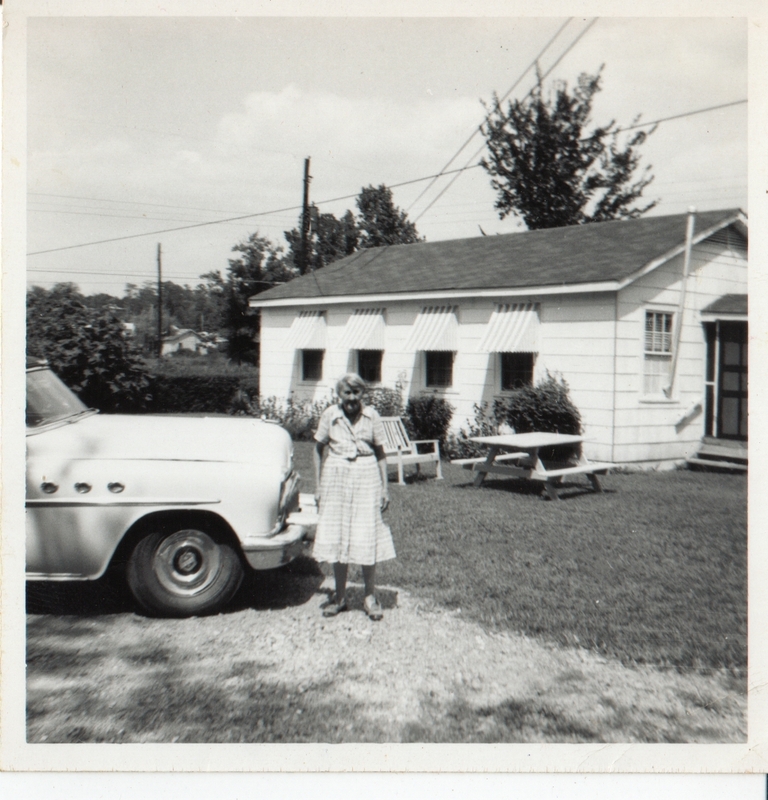 Lucinda and the children moved to Wilmot, AR living with her older (half) sister Martha and her husband Ben Staton, Sr. who was a lawyer. 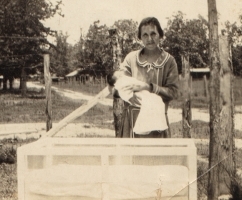 Staton helped make arrangements for Lucinda and the three children to enter an orphanage called the Working Women's Home in Little Rock, AR. 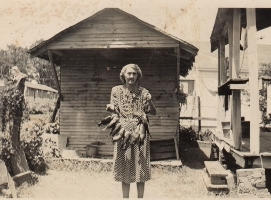 Lucinda was briefly married a second time to Mr. Ervin, a widower with 3 children. 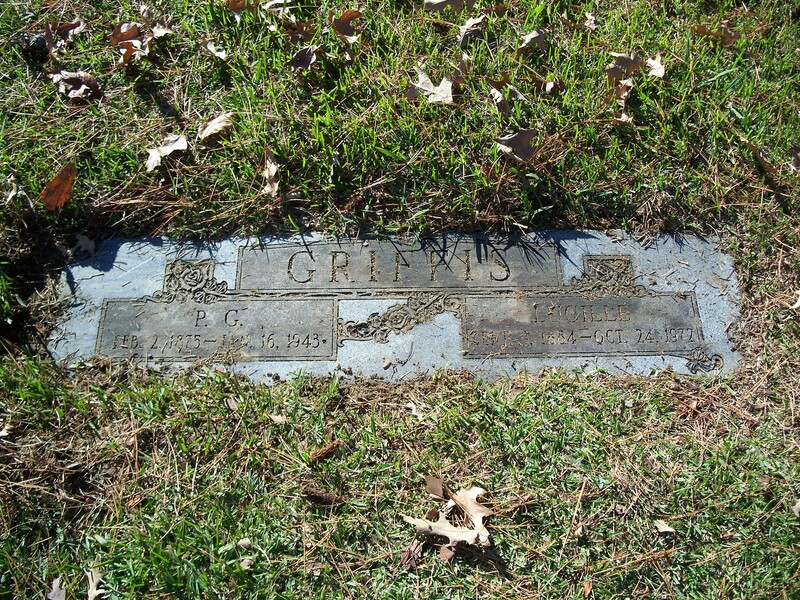 Around 1917, Lucinda married Pearl Griffis (1875 - 1943), providing a stable home for the three children. 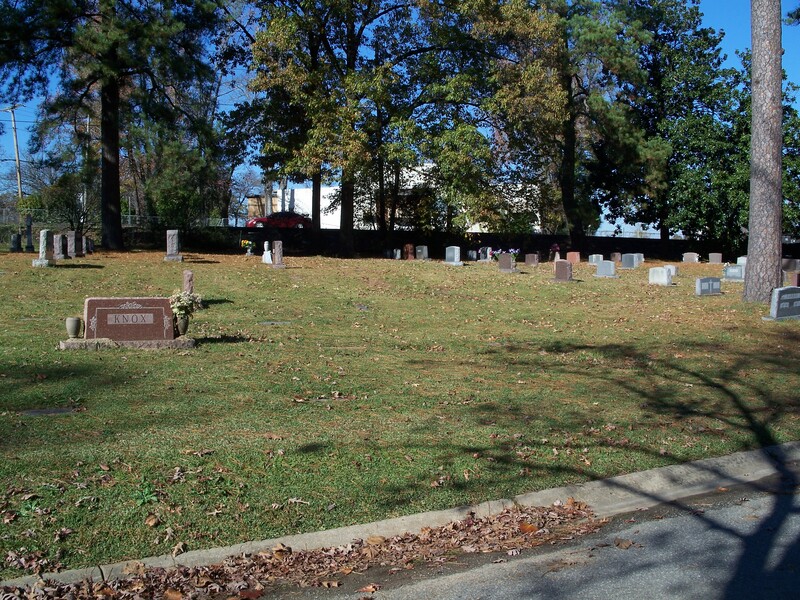 Lucinda passed away October 24, 1972 in Little Rock, AR and is interred in Roselawn Cemetery, 2801 Asher Ave, Little Rock, AR (listed in the SSDI as Lucille Griffis). 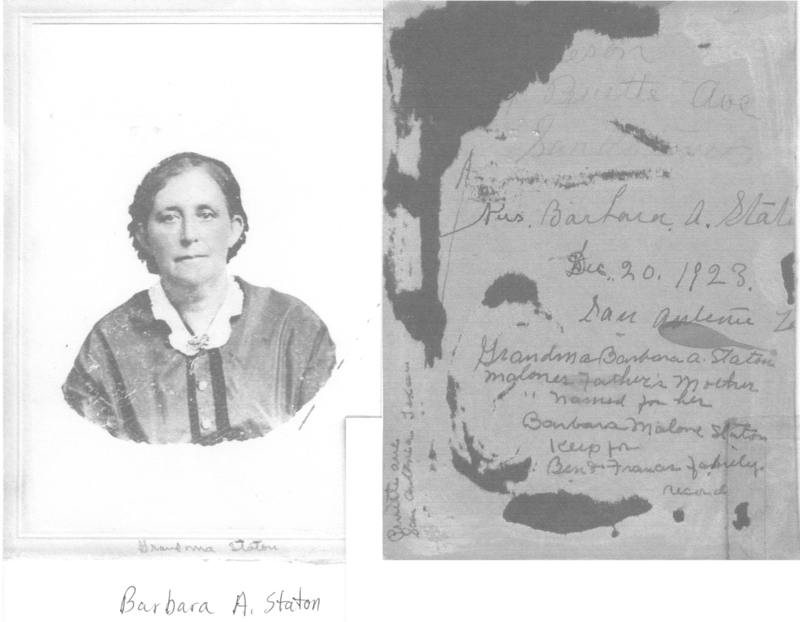 "Lucinda Harper and Mildred Lucile"
Eliza Varden (1848 - 1927): In the 1900 census a 14-year-old Lucinda is listed as living with her widowed aunt, Eliza J. Varden (nee Condren), her twin brother, Pleasant Harper, and Eliza's two daughters, Malissa E. and Carie O. 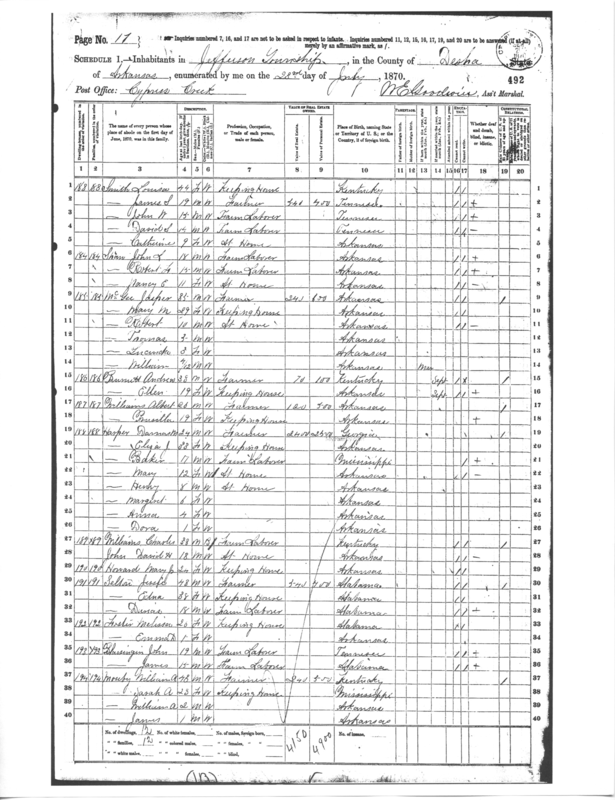 Contrary to the 1880 census entry for Derious Harper (Lucinda's presumed father), in 1900 Lucinda's father is listed as being from Tennessee and her mother from Arkansas. 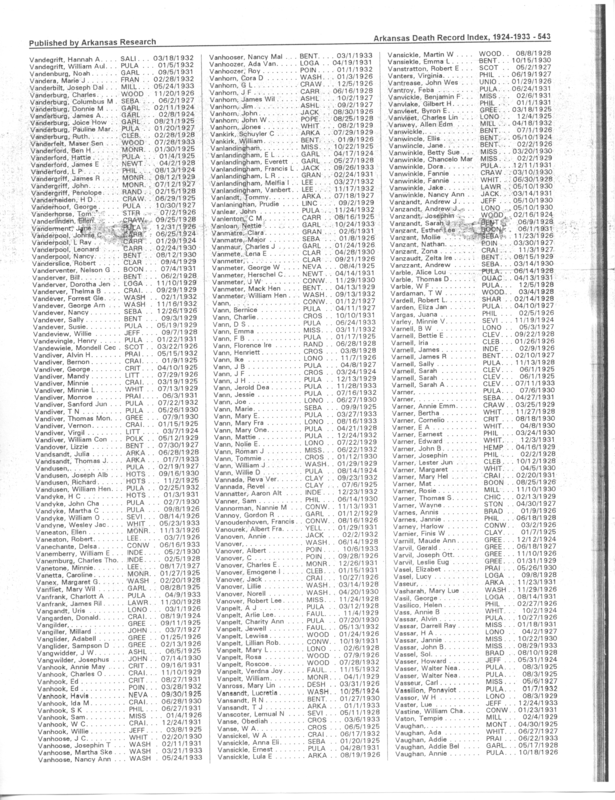 A marriage record lists William Varden (age 40) marrying Jane Condren (age 21) on 27 July 1872. Saunders believes this may have been Eliza Jane Varden. 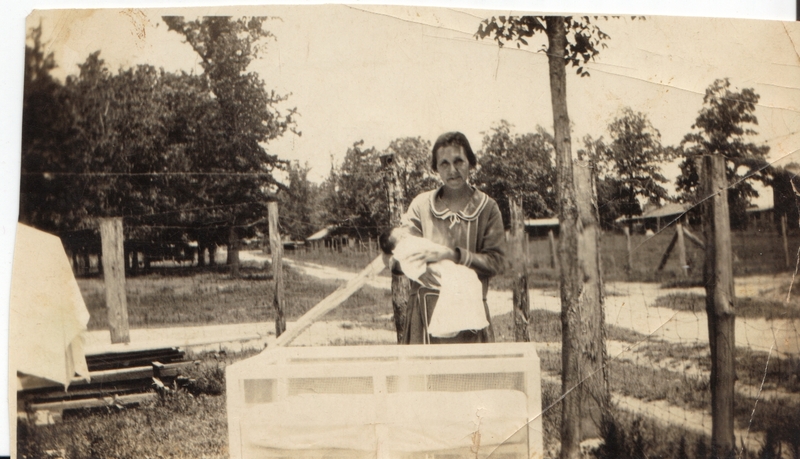 Eliza Jane Varden (nee Condren) passed away in Pulaski County on 10 April 1927. 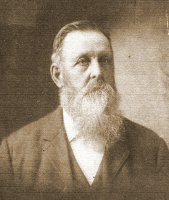 Derious M. Harper (1826 - 1885?) 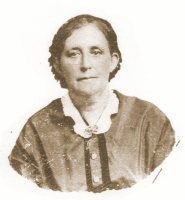 and Martha E. Condren (1847 - 1885): The likely candidates for Lucinda Harper's parents are Derious M. Harper and Martha E. Condren (widow Riley). 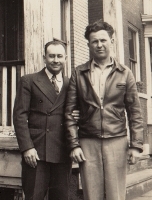 All known records of Derious Harper are hand-written and his name may also have been Darious, Deronia, Darnas or Denious. 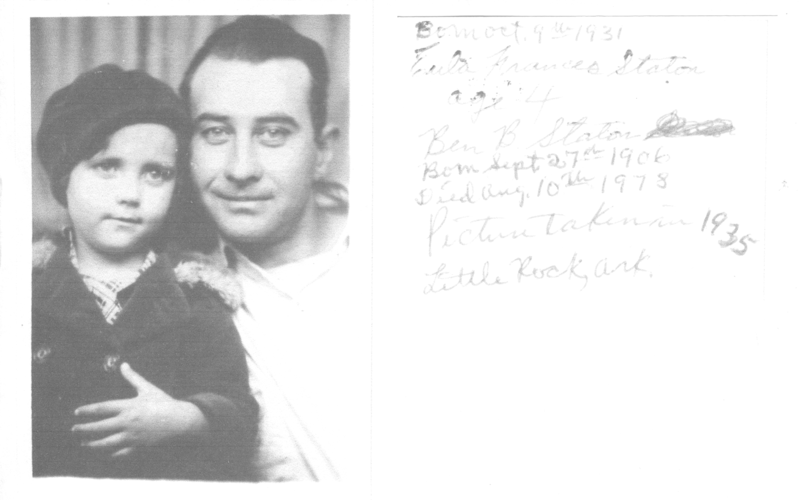 He is often listed in land records as "D.M. 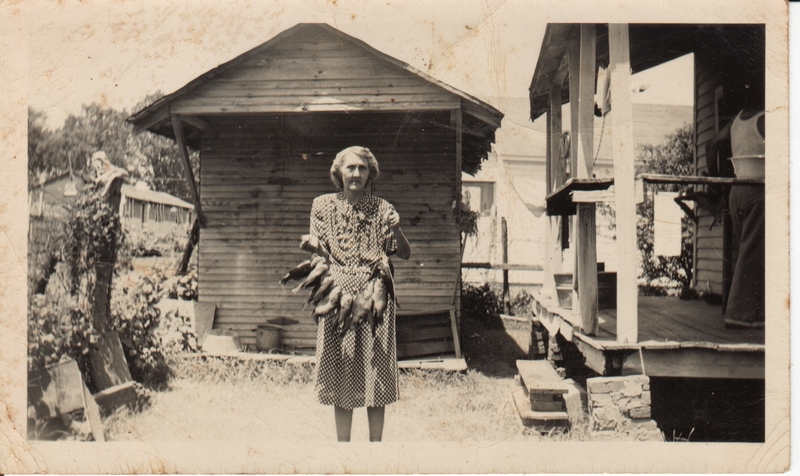 Harper." Saunders found evidence that Derious Harper may have been married five (!) 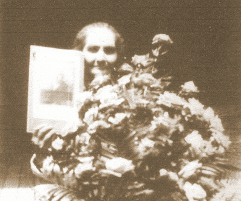 times, the last of which was to Lucinda's mother. 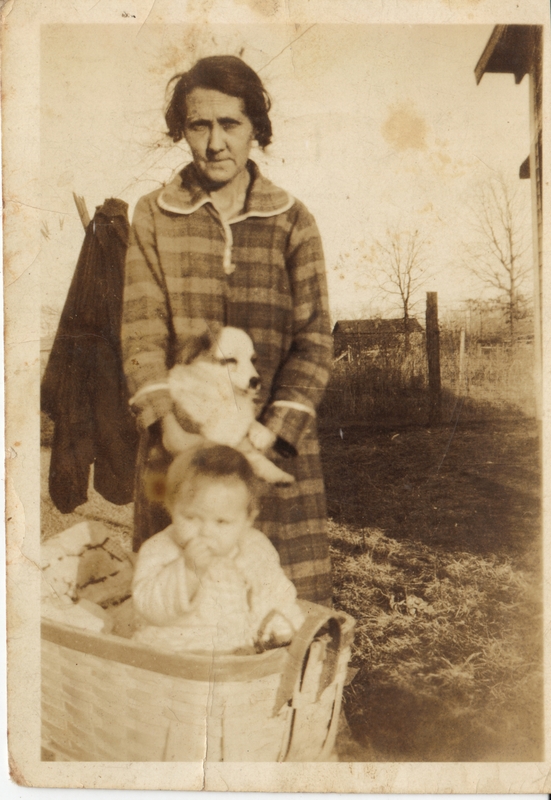 Since Lucinda was not born in time for the 1880 census and her parents passed away before 1890 census (which was lost in a fire), there is no census record of her in the Harper household with her parents. 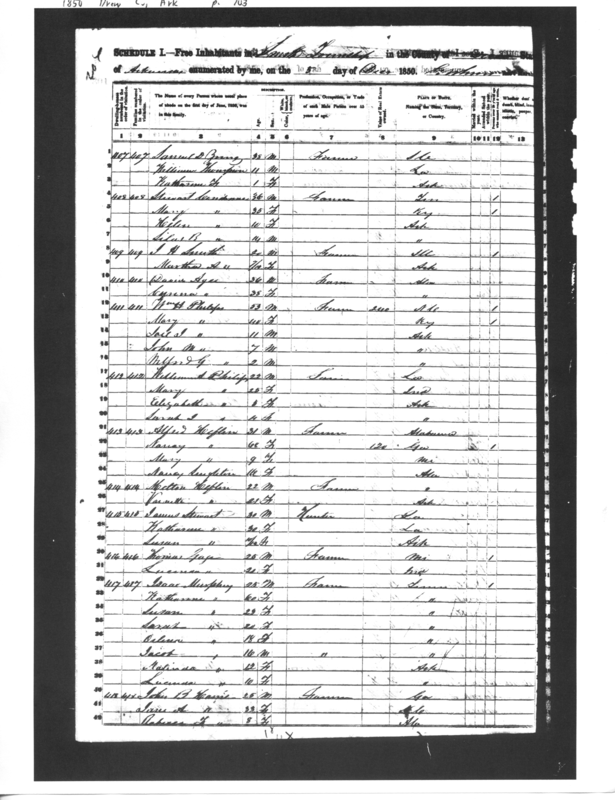 In the 1880 Census, Derious M. Harper (aged 44, grandfather of Frank Privett) is listed living with his wife Martha E. (grandmother of Frank Privett) and five children: Anna J., Dorha, Mattie, Emma, Eddie and George R. Also listed is a six-year-old step-daughter, Martha J. Riley. 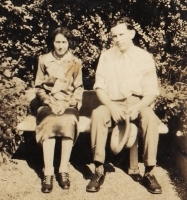 This is the family into which Lucinda Harper (mother of Frank Privett) is believed to have been born on 9 September 1884, although contrary to the 1900 census record, Derious is listed as being from Georgia. Also contrary to family lore, Derious is listed as White (not Native American or Colored). 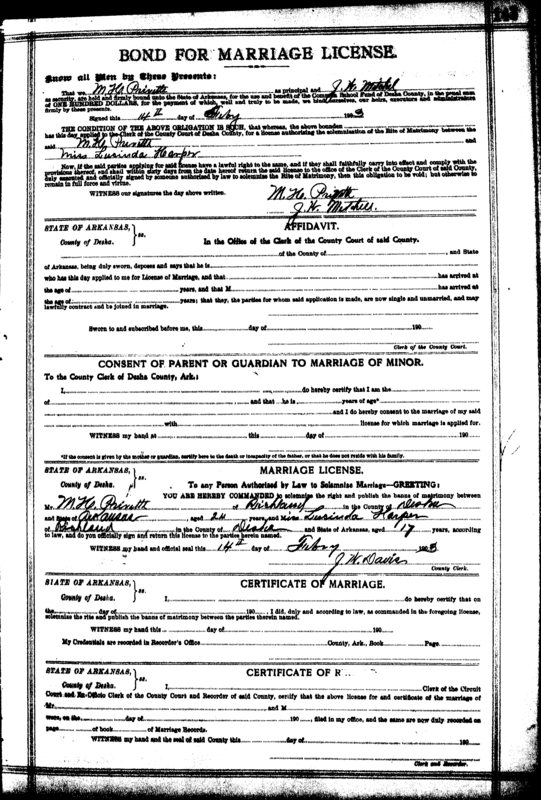 Although no marriage record exists for Derious' fifth marriage to the widow Martha Riley (nee Condren), there is a marriage record for D.M. 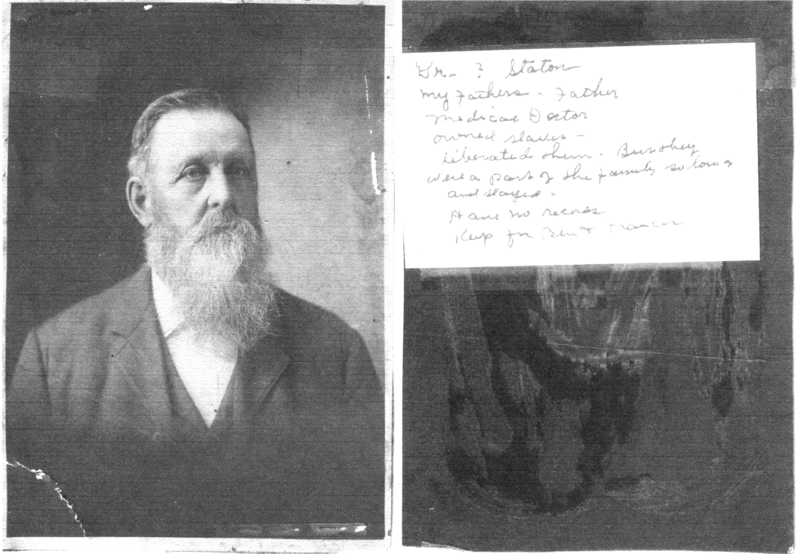 Harper (age 50) marrying his possible fourth wife, Nancy A. Blake (age 40) on 11 February 1877. 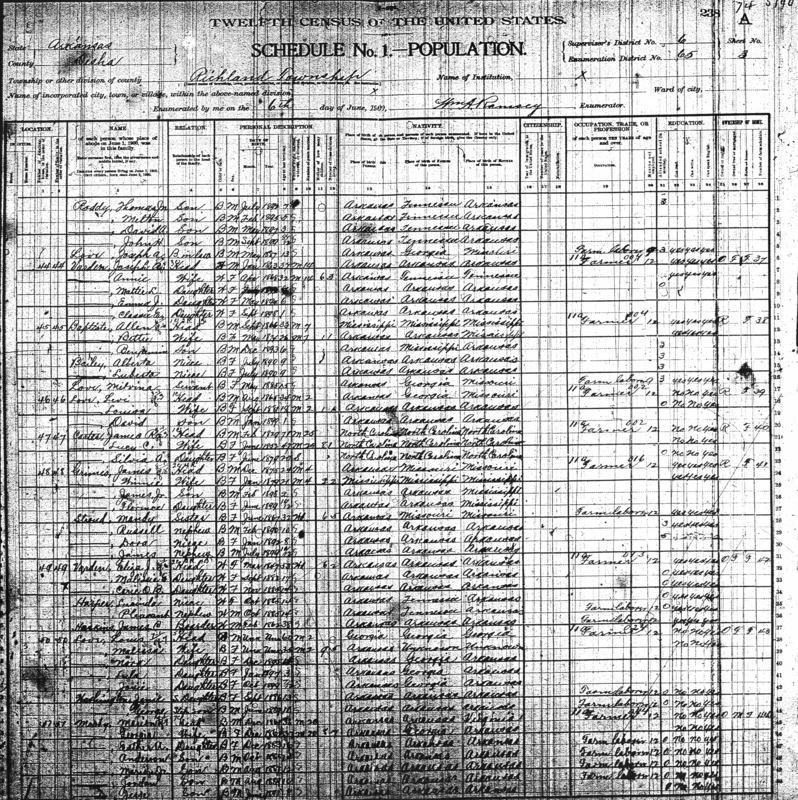 1870 is the first census appearance for Derious Harper living with Eliza J. Harper and six children. Derious's age is listed as 24, although this likely should be 44. Derious's birthplace is listed as Georgia. 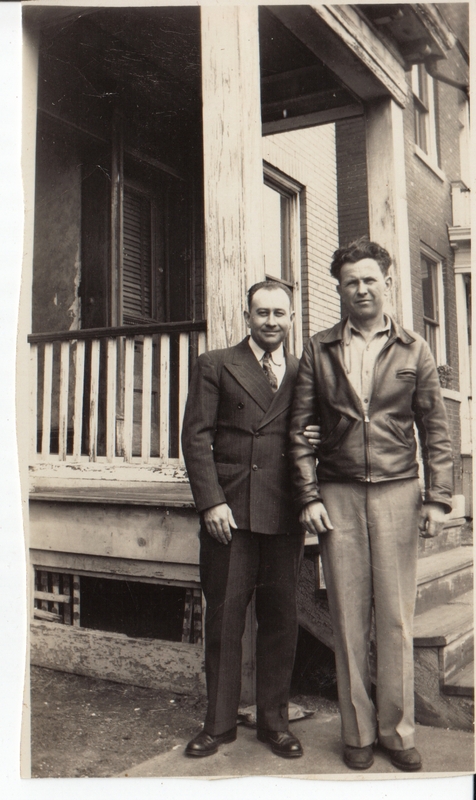 Saunders believes this is Derious's second marriage. 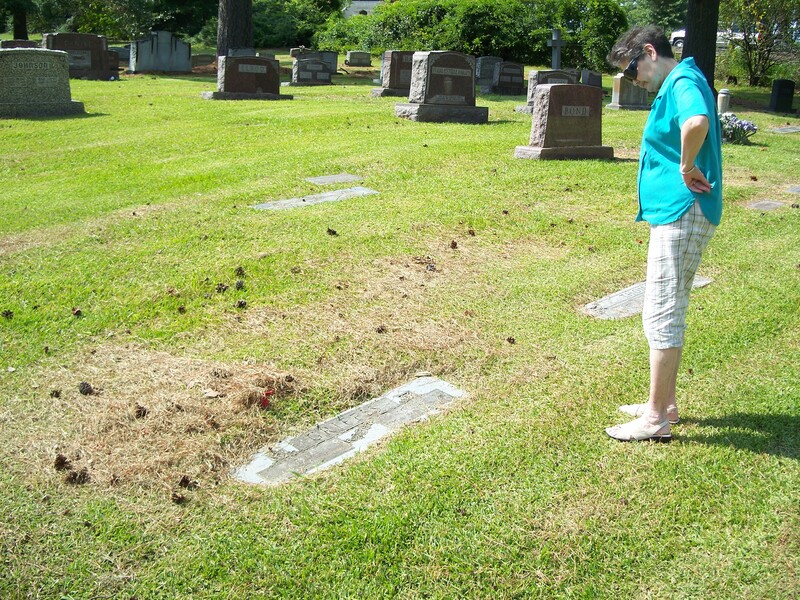 Derious and/or Martha Harper passed away when Lucinda Harper was young, although no death record has been found for either. 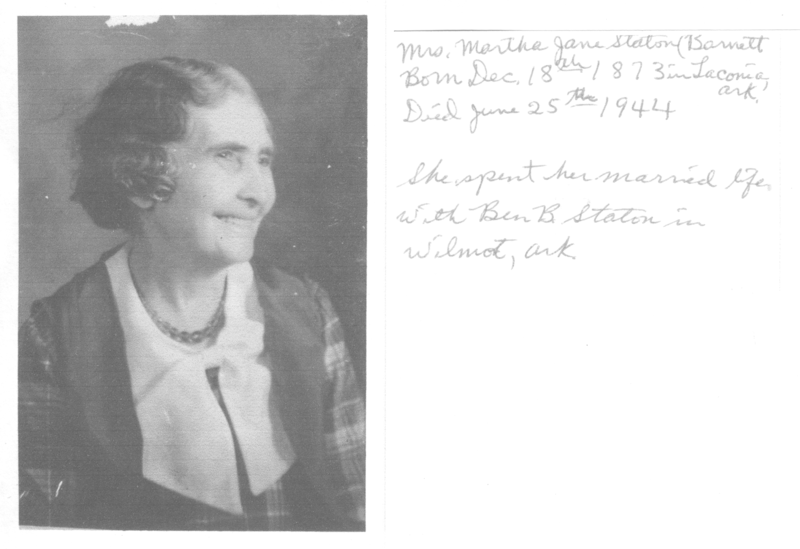 The Index to Wills and Administrations of Arkansas From the Earliest to 1900 lists a will for Martha Elizabeth Harper in 1885, the year after Lucinda was born. 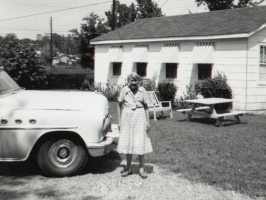 Mary Ann Condren (b. 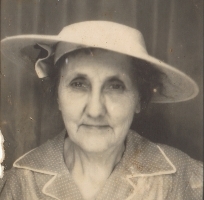 1825) Saunders believes that Mary Ann Condren is Frank Privett's great-grandmother due to connections through Eliza Jane Varden (nee Condren). 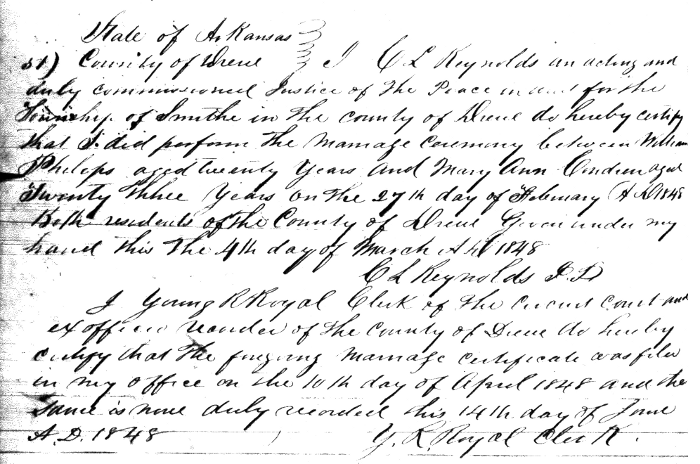 In the 1860 census, William and Mary Ann Philips are listed as living in Richland Township (Desha County, AR) with four children: Martha (age 13), Eliza Condren (age 12), William Jr. (age 6) and another Martha (age 6). 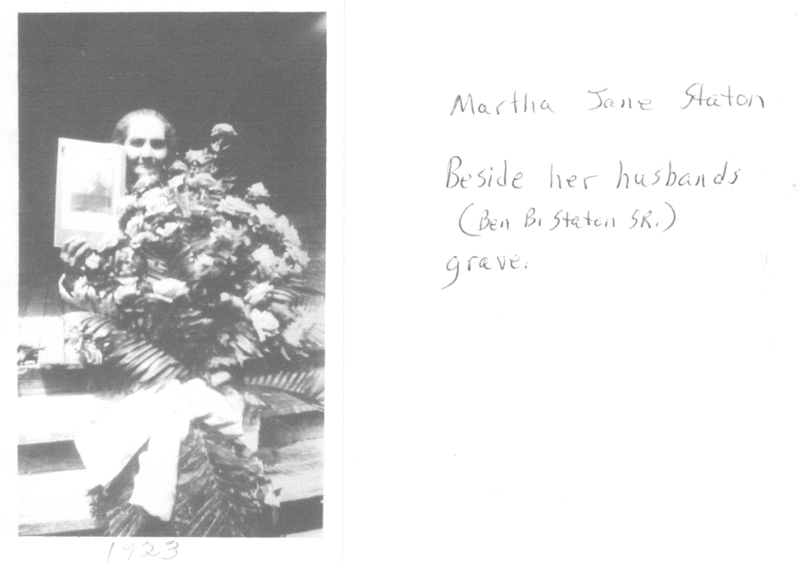 Saunders believes the 13-year-old Martha is actually Martha Condren (Frank Privett's grandmother) from Mary Ann's presumed first marriage and that Eliza is Eliza Jane Varden. 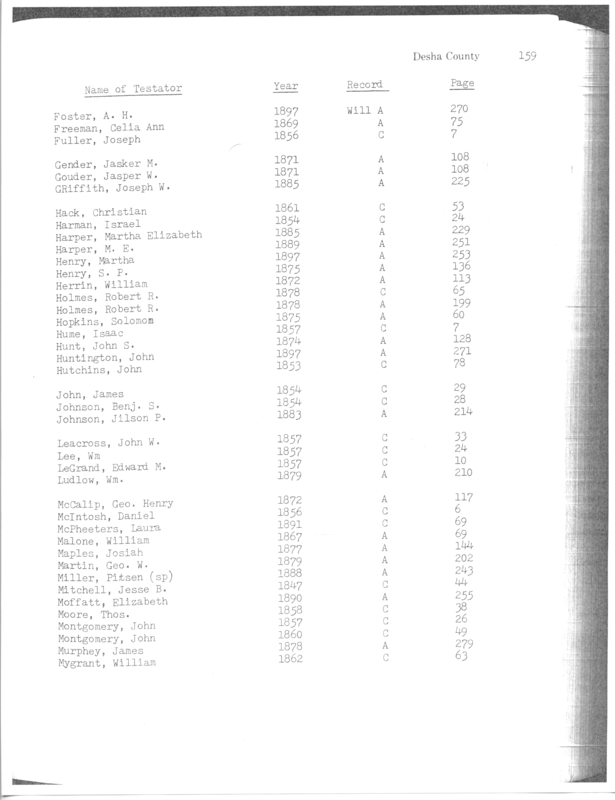 A marriage record lists William Phillips (b. 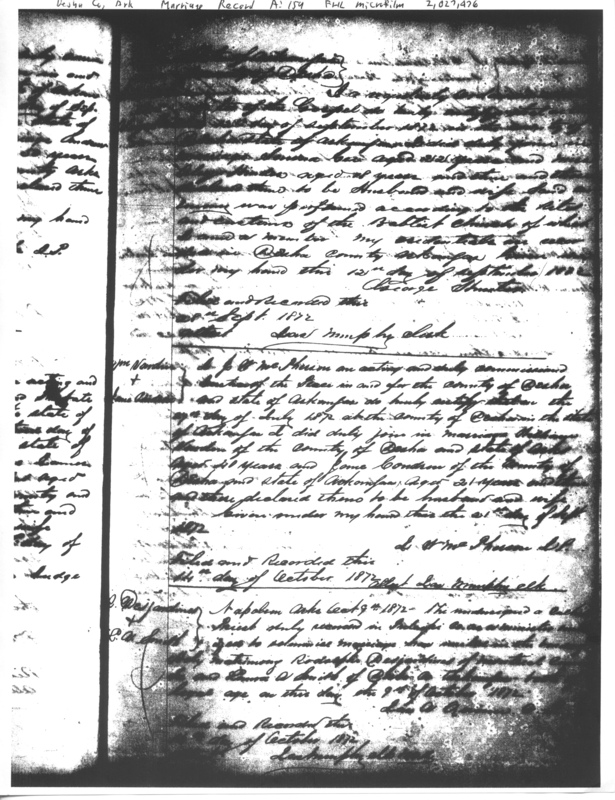 1825) marrying Mary Ann Condren on on 27 February 1848. 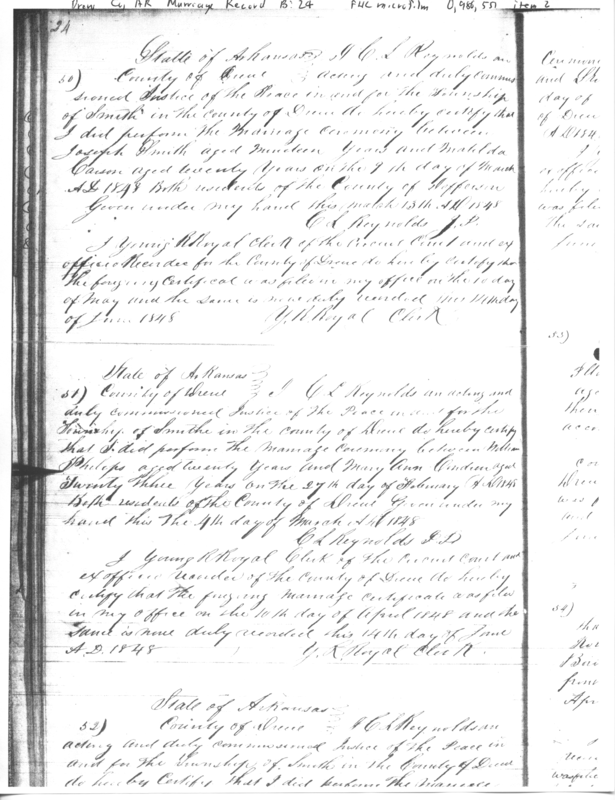 The 1850 census lists William and Mary Ann Philips are listed as living in Smith Township (Drew County, AR) with two children, Elizabeth and Sarah J. Saunders believes that Elizabeth is Martha Elizabeth Condren (grandmother of Frank Privett), a child from Mary Ann Condren's prior marriage. 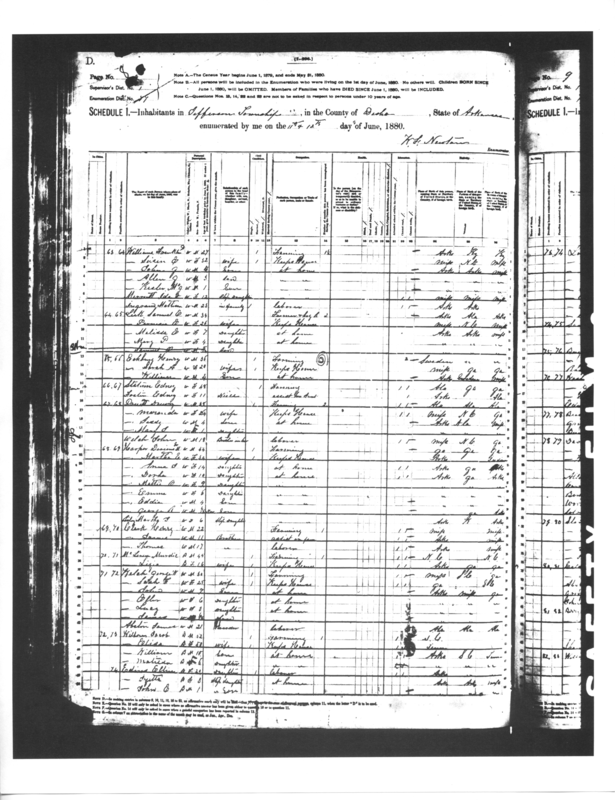 However, this does not account for Eliza Jane Condren (later Varden) who is present in the 1860 census as another child from Mary Ann's prior marriage. 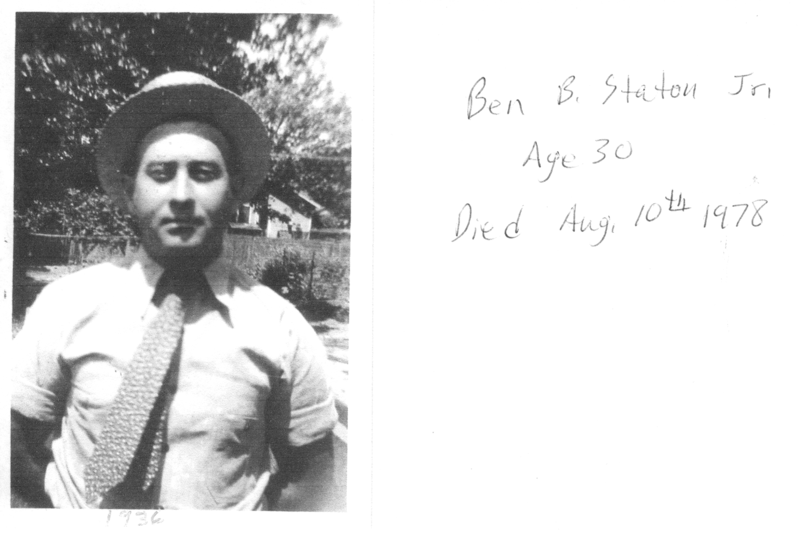 Ben Staton, Sr. was a lawyer in Wilmot, AR (Desha County). 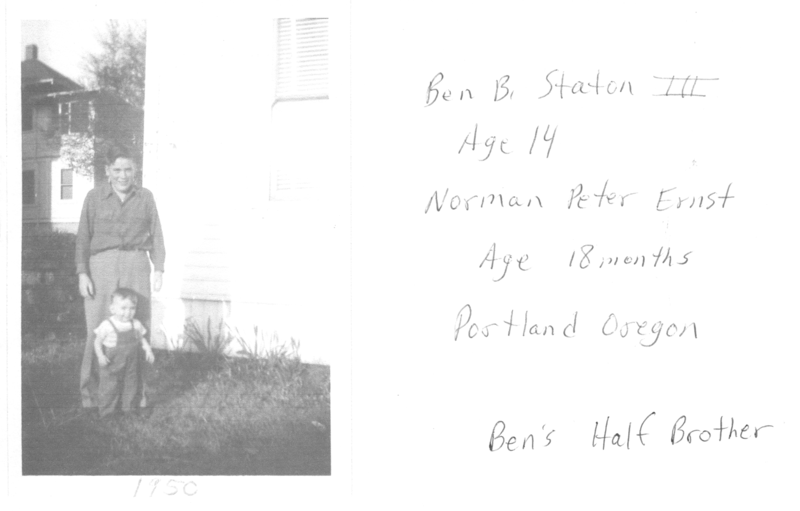 He was the first of three Ben Statons and the Staton family apparently remained friendly with the Privetts after Ben's passing. 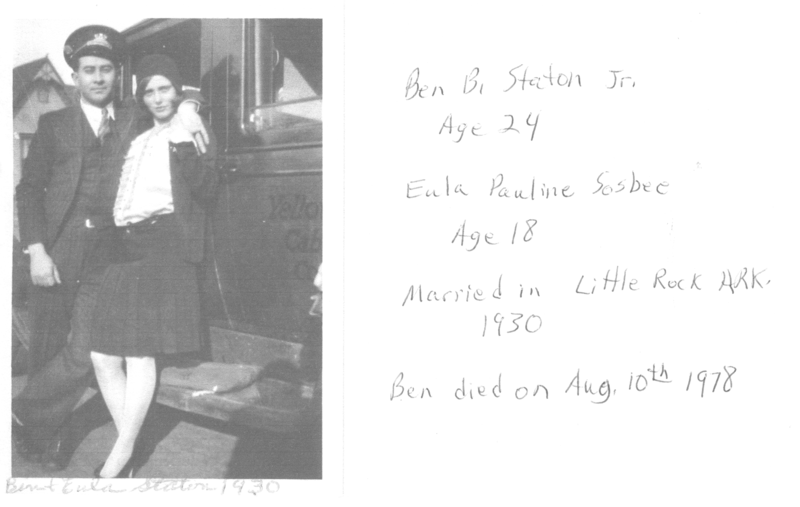 Dr. Staton, father of Ben Staton, Sr.
Barbara Staton, mother of Ben Staton, Sr.